I tried to be a good girl and save my money, I really did. But when pictures and reviews of the Clarins 2014 collection started popping up all over my Bloglovin' feed I was sure I couldn't hold off much longer. I already admitted to my lusting over them in a post earlier last week, in which I promised myself I would only get one. But I broke that promise when I was standing in front of the display and I bought two of the Clarins Multi Blush shades. The shades Candy and Grenadine are now mine, and boy, they are wonderful. Judging by the amount of products in my collection you could say that I love cream blushes. Some people say they require getting used to, but I've always found them easier to work with. I love feeling a product as it goes onto my skin. I hardly ever know what I'm doing with powder blush. 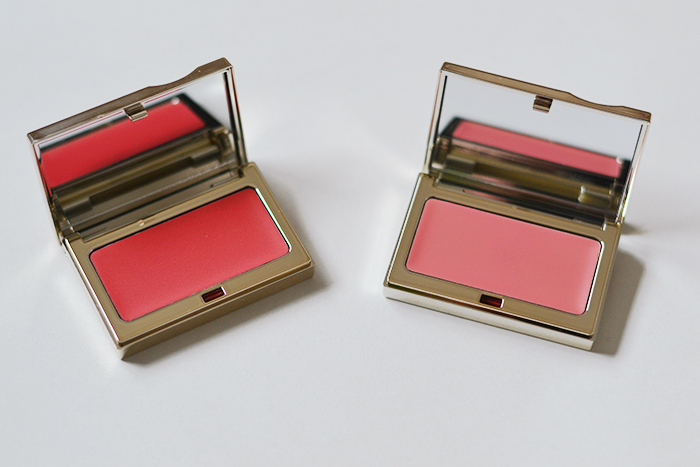 I have come to grips with tons of different cream blush formulas, but the Clarins Multi-Blush formula isn't like any other I have ever tried. It feels very creamy and soft in the pan, but once applied it immediately dries down into a powder. 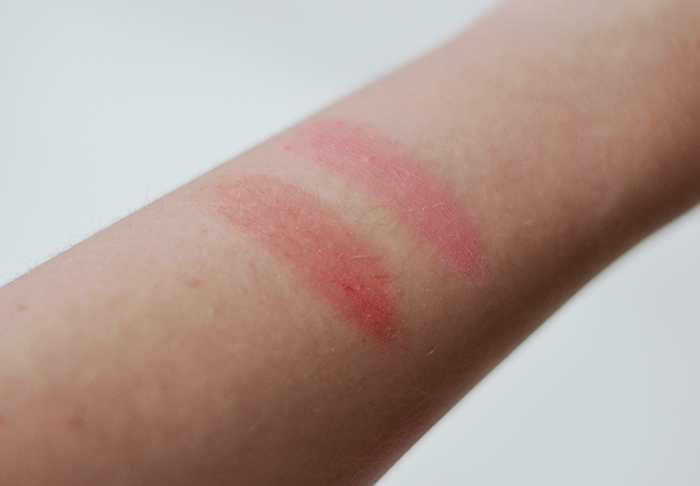 It melts easily and becomes completely matte as it dries down on your skin. The formula is enriched with floral waxes from rose, mimosa, jojoba and sunflower, which all help to prevent dehydration. So besides being incredibly pretty they also come with skincare benefits. Grenadine is a gorgeous color, it's a bright coral red. Applied onto the skin it looks like you've just been walking outside in the cold. It has that natural flush quality to it. It might seem a little scary in the pan, but I promise you that this won't be as scary on the cheeks. Candy is the star of this collection in my opinion. Much rosier than Grenadine, it's super natural and sheer on the cheek. It has incredibly fine-milled golden shimmer in it that is hardly noticeable on the skin. I've been wearing this all through the weekend and even today, where I've just been lounging around the house all day. If you get any of these shades, Candy is the one. As the swatch shows these go on quite sheer. They're easy to build up if you want a stronger color, but a single swipe will do for that natural flush that most of us seem to want. You can use both fingers or a brush, but because this is so different to other cream blushes, I actually prefer using my Real Techniques contouring brush. 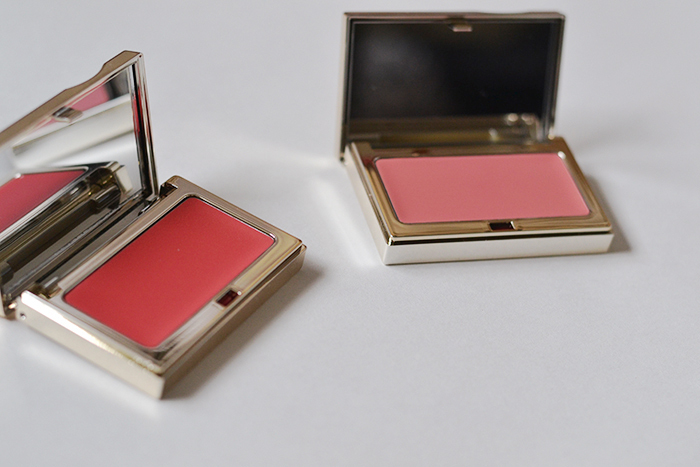 The Clarins Opalescence Spring Collection with these gorgeous blushes is available right now.